Named after the dramatic Trollfjord in Lofoten, MS Trollfjord offers comfortable and modern facilities, with extensive use of Norwegian wood and stone. With a two-storey panorama lounge, sauna, Jacuzzi and choice of dining venues, guests can experience the beautiful sights of the Norwegian coastline aboard this relaxed and informal ship. Belonging to the line's Millennium class of ships, MS Trollfjord is one of the most modern ships in the fleet, joining Hurtigruten's fleet in 2002. Along with her sister vessel, MS Midnatsol, she is the largest ship to sail the coastal route, offering passengers increased comfort and space on board. There are several options for accommodation on board MS Trollfjord to suit all tastes and requirements. 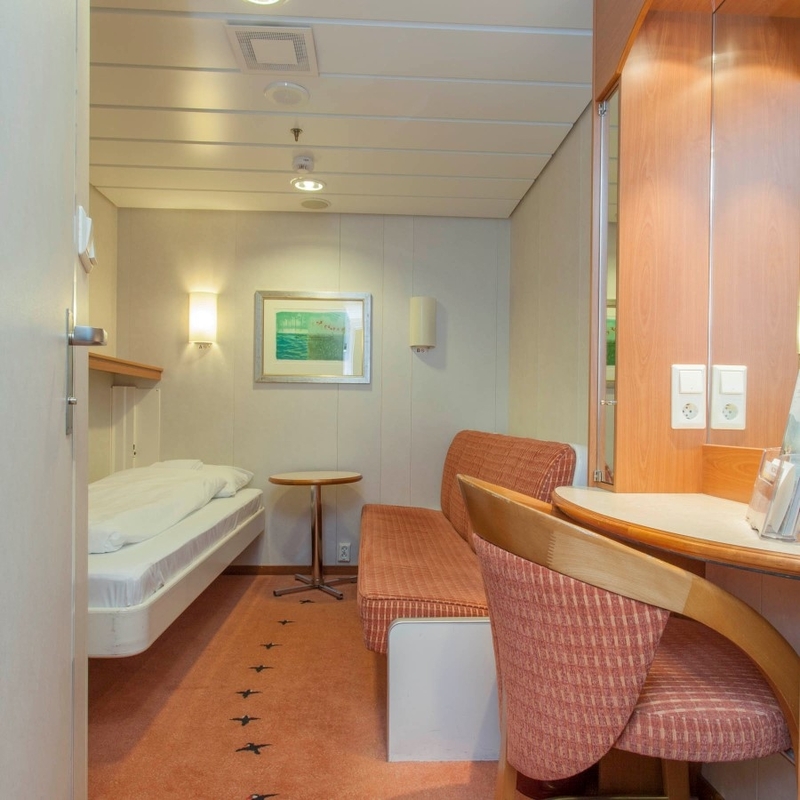 Single and Interior cabins are well-presented, decorated with light woods and colours for a bright, cosy atmosphere. Outside cabins offer guests a private view of the Norwegian scenery, either via portholes or windows. For more spacious accommodation there are four categories of suites: Mini Suite, Grand Suite, Owner’s Suite and MS Trollfjord Suite. In addition to extra room, some of these suites also offer a personal Jacuzzi, private balcony or bay window and separate dining area. Experience delicious authentic Norwegian cuisine and eat like a true local with Hurtigruten’s unique dining concept, Norway's Coastal Kitchen. Guaranteeing seasonal, fresh food from the local area, the talented chefs proudly tell the story of the local coastline through their delicious dishes. There is an exceptional opportunity for the chefs to obtain fresh produce from local suppliers at each port. Guests can expect substantial breakfast and lunch buffets, with Norwegian specialities and international favourites, as well as three-course fine dining each evening. Magnificent views and the chance to visit the many villages and towns on route contribute to the particular appeal of this ship. Relax in the two-storey Panorama Lounge, with its floor-to-ceiling windows offering front-row seats to the breath-taking views of the fjords. Get closer to the scenery on the sun deck, where guests can enjoy the gentle parade of scenery from the comfort of a lounge chair or immersed in the warmth of the Jacuzzi. The ships amphitheatre is host to occasional lectures by experts, covering fascinating topics from the northern lights to Norwegian Christmas traditions. When crossing the Arctic Circle, guests will experience a light-hearted ceremony conducted by the crew, who have even been known to dress up and recant mythical stories of the local regions through which the ship sails. Unspecified accessible cabin, adapted for guests with disabilities. Outside accessible cabin with portholes, single beds, one bed can be turned into a sofa. Some with upper/lower berths. Grand suite, 35 – 37 m2 (377- 398 sq ft), one or two rooms, seating area, TV, stereo, internet access, mini-bar, some with Jacuzzi, most with private balcony or bay window.